The ideal male is 24 to 26 inches in height and female 22 to 24 inches in height measured at the withers. Dogs are to be penalized in accordance to the degree they deviate from the ideal. Males under 23 inches or over 26½ inches or females under 21 inches or over 24½ inches are to be disqualified. The body is square; the length measured from the point of shoulder to the point of the rump approximates the height. Females may be somewhat longer in body. Bone structure is medium in proportion to height, so that he is wellbalanced throughout and neither spindly or leggy nor cumbersome and bulky. Well-chiseled, skin taut, long without exaggeration. Expression intelligent and questioning, indicating alertness, attention and readiness for action. Eyes dark brown, mediumsize, slightly almond shape, not protruding. Light, yellow or round eyes are a fault. Ears triangular in shape, well-cupped, stiff, erect; height equal to width at base. Set high, the base of the ear does not come below the center of the eye. Hanging ears, as on a hound, are a disqualification. Skull and muzzle measuring from the stop are of equal length. Overall size is in proportion to the body, top of skull flattened rather than rounded, the width approximately the same as but not wider than the length. Stop moderate. The topline of the muzzle is parallel to the topline of the skull when viewed from the side. Muzzle moderately pointed, avoiding any tendency toward snipiness or cheekiness. Jaws strong and powerful. Nose black without spots or discolored areas. Nostrils well defined. Lips tight and black, no pink showing on the outside when mouth is closed. Teeth - Full complement of strong white teeth, evenly set, meeting in a scissors or a level bite. Overshot and undershot teeth are a fault. An undershot bite such that there is a complete loss of contact by all the incisors is a disqualification. Broken or discolored teeth should not be penalized. Missing teeth are a fault. Four or more missing teeth are a serious fault. Neck round, muscular, rather long and elegant, slightly arched and tapered from head to body. Skin well-fitting with no loose folds. Withers accentuated. Topline level, straight and firm from withers to croup. Body - Croup medium long, sloping gradually to the base of the tail. Chest not broad without being narrow, but deep; the lowest point of the brisket reaching the elbow, forming a smooth ascendant curve to the abdomen. Abdomen moderately developed, neither tucked up nor paunchy. Ribs well-sprung but flat on the sides. Loin section viewed from above is relatively short, broad and strong, but blending smoothly into the back. Tail strong at the base, the last vertebra to reach at least to the hock. At rest the dog holds it low, the tip bent back level with the hock. When in action, he may raise it to a point level with the topline giving it a slight curve, but not a hook. Tail is not carried above the backline nor turned to one side. A cropped or stump tail is a disqualification. Body rich fawn to russet mahogany with black overlay is ideal and preferred. Predominate color that is pale, washed out cream or gray is a fault. The coat is characteristically double pigmented whereby the tips of fawn hairs are blackened. 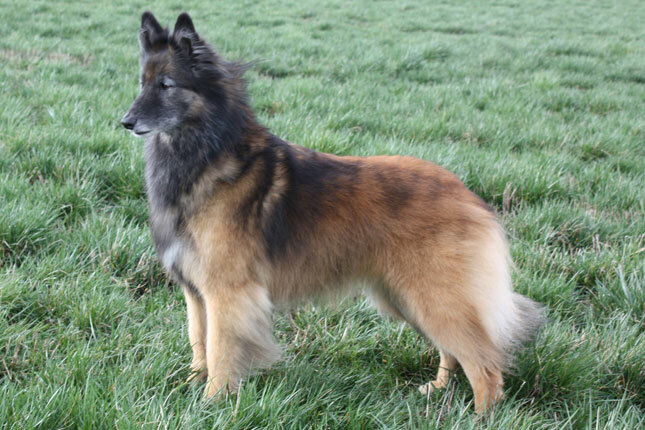 Belgian Tervuren characteristically become darker with age. On mature males, this blackening is especially pronounced on the shoulders, back and rib section. Blackening in patches is a fault. Although allowance should be made for females and young males, absence of blackening in mature dogs is a serious fault. Chest is normally black, but may be a mixture of black and gray. White is permitted on the chest/sternum only, not to extend more than 3 inches above the prosternum, and not to reach either point of shoulder. Face has a black mask and the ears are mostly black. A face with a complete absence of black is a serious fault. Frost or white on chin or muzzle is normal. The underparts of the body, tail, and breeches are cream, gray, or light beige. The tail typically has a darker or black tip. Feet - The tips of the toes may be white. Nail color may vary from black to transparent. Solid black, solid liver or any area of white except as specified on the chest, tips of the toes, chin and muzzle are disqualifications. Lively and graceful, covering the maximum ground with minimum effort. Always in motion, seemingly never tiring, he shows ease of movement rather than hard driving action. He single tracks at a fast gait, the legs both front and rear converging toward the centerline of gravity of the dog. Viewed from the side he exhibits full extension of both fore and hindquarters. The backline should remain firm and level, parallel to the line of motion. His natural tendency is to move in a circle, rather than a straight line. Padding, hackneying, weaving, crabbing and Page 3 of 3 similar movement faults are to be penalized according to the degree with which they interfere with the ability of the dog to work. Any deviation from these specifications is a fault. In determining whether a fault is minor, serious, or major, these two factors should be used as a guide: 1. The extent to which it deviates from the standard. 2. The extent to which such deviation would actually affect the working ability of the dog. Males under 23 inches or over 26½ inches or females under 21 inches or over 24½ inches. Hanging ears, as on a hound. An undershot bite such that there is a complete loss of contact by all the incisors. A cropped or stump tail. Solid black, solid liver or any area of white except as specified on the chest, tips of the toes, chin, and muzzle. Click Here to Learn about breeder background checks on Belgian Tervuren breeders if you are looking for Belgian Tervuren puppies for sale. Click Here to learn how ResearchBreeder.com can help you find healthy Belgian Tervuren puppies for sale. Click Here to order a Breeder or Kennel Background Check on Belgian Tervuren Breeders that may have Belgian Tervuren puppies for sale. Click here to find the national breed club for Belgian Tervuren puppies for sale. Click Here to purchase a list of approved ResearchBreeder.com Belgian Tervuren Breeders who have Belgian Tervuren puppies for sale.